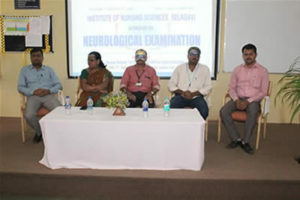 On the occasion of World Alzimer’s Day 2018, Department of Mental Health Nursing, KAHER Institute of Nursing Sciences, Belagavi organized a Workshop on “Neurological Examination” on 21st September 2018 at KAHER Institute of Nursing Sciences Belagavi. The welcome speech was delivered by Mrs. Samjana Giri 2nd Year M.Sc Nursing student. 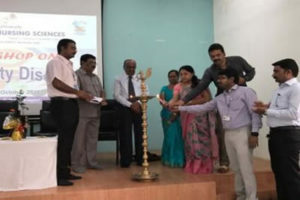 On this occasion Key note address was delivered by Mr. Gururaj Udapi Asst Prof and HOD Dept of Mental Health Nursing along with Organizing Secretary Mr. Manjunath Sogalad Asst Prof Dept of Mental Health Nursing, KAHER Institute of Nursing Sciences, Belagavi. 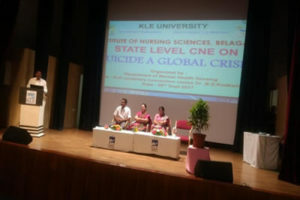 Prof.(Mrs.) Sumitra L A, Vice Principal, KAHER Institute of Nursing Sciences, Belagavi, delivered the presidential remarks & emphasized on importance of conducting Neurological Examination. The Vote of thanks for the inaugural function was given by, Ms. Veena Kardiguddi, 2nd Year M.Sc Nursing , Department of Mental Health Nursing. The Scientific sessions began at 9:30am. 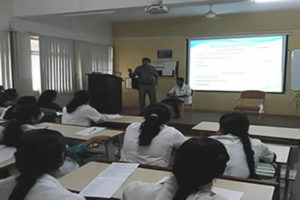 In the first session Dr (Prof) Mr. R D Virupaxi Prof & HOD Dept of Anatomy JNMC KAHER Belagavi, delivered an expert lecture on Overview of Nervous System. The second session of expert lecture was on “Neurological Assessment, which was delivered by Dr. Anil Murgod, Asso Prof KIPT KAHER, Belagavi. Mr. Veeresh Nandahgaon Asso. 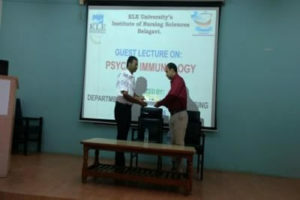 Prof. KAHER INS Belagavi, rendered an expert lecture on “Mental Status Examination”. In the post lunch session, the first lecture was on “Role of Nurse in Neurological Examination”, delivered by Mr. Manjunath Sogalad. Asst. Prof. Dept of Mental Health Nursing KAHER INS Belagavi, Practical Sessions were carried out and later sessions on Neurological Examination by Faculty of Mental Health Nursing. 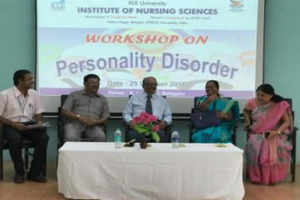 Mr. Ashok Kamat, Mr. Amey Khande, Mrs. Sushma Patil, Mr. Somshekhar Karadi, Mr. Sangangouda Shanbhog faculty and PG Students from Department of Mental Health Nursing, were present. 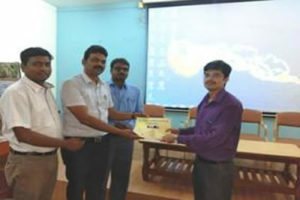 150 students had participated in the workshop and were benefitted. 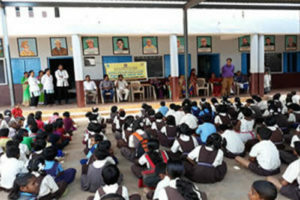 The Department of Mental Health Nursing, KLE Academy of Higher Education and Research, Institute of Nursing Sciences Belagavi, had organized a school Health Program on “Effects of Yoga and Meditation on Mental Health” for the School children, at Government Primary School and Higher Secondary School, Kakati (Kannada, Marathi, and Urdu medium) Belagavi on 21st June 2018. 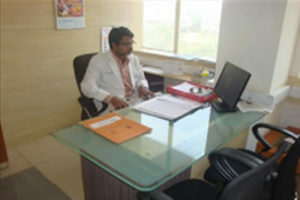 Mr. Gururaj Udapi, Assistant Professor & I/C H.O.D, Dept. 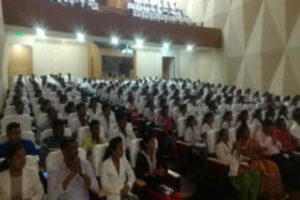 of Mental Health Nursing introduced the topic and focused on importance of “Yoga and meditation”. 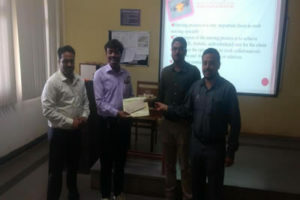 The Lecture was delivered by Mr. Sangangouda Shanabhag, Senior Tutor, Dept of Mental Health Nursing KAHER Institute of Nursing Sciences Belagavi and Mr. Manjunath Sogalad, Assistant Profgessor, Dept of Mental Health Nursing delivered the vote of thanks. 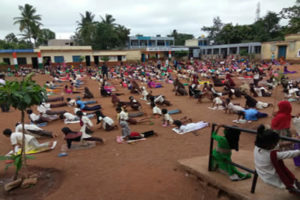 Total 650 School children and Teachers were present during the session and they were also actively involved in the program as followed by the demonstration of Yogasana’s performed by the Yoga teachers of the school. Mr. Veeresh Nandagaon and Mrs. Sushma Patil were present during the program. The Department of Mental Health Nursing, KAHER Institute of Nursing Sciences Belagavi, had organized a Health Education program on Ill Effects of consuming Tobacco on the occasion of World No Tobacco Day on 31st May 2018 at Government Higher Primary School Kakati Belagavi. 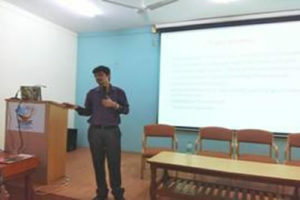 The health education was given by Mr. Satish Koujalgi, Asst Prof & Psychiatric Social Worker JNMC Belagavi. Mr. Gururaj Udapi HOD Dept of Mental Health Nursing KAHER INS Belagavi briefed about the importance of the day. 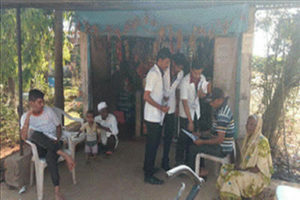 Asso Prof Mr. Veeresh Nandgaon, Mr. Amey Khande Senior Tutor, Department of Mental Health Nursing along with 4 PG Students were present during the occasion. Around 120 7th and 8th standard students, and around 80 other students and staffs were benefitted by the program. The Department of Mental Health Nursing, KAHER Institute of Nursing Sciences Belagavi, organized a Guest Lecture on “De Addiction Therapy” for the Nursing Students of KAHER Institute of Nursing Sciences Belagavi on 23-02-2018. 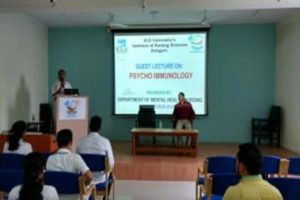 The Expert Lecture was delivered by Dr. Sandeep Patil Assistant Professor, department of Psychiatry Nursing, KAHER J.N.Medical College, Belagavi. After the lecture the forum was open for queries to clear their doubts. 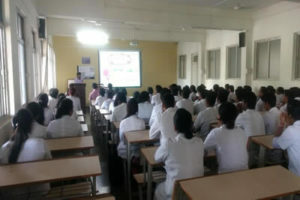 Total 156 Nursing Students were benefited by the guest lecture.All the Staffs of Department of Mental Health Nursing, B. Sc (N) 3rd Year, and 2nd year GNM students were participated in the program. 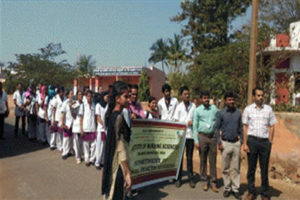 On the eve of World Consumers Rights Day K.L.E.U’s Institute of Nursing Sciences Belagavi Department of Mental Health Nursing had organized a rally on Consumers Rights and created awareness regarding the rights of the consumers at Ranakunde Village on 14-03-2017. During the rally students raised slogans with banners in their hands underlining the importance of the drive and distributed the pamphlets regarding the consumer’s rights. Around 400 villagers were benefited by the rally. 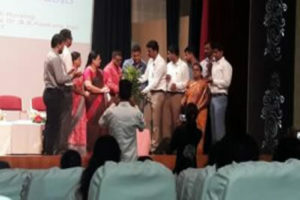 Around 50 students along with faculty of Department of Mental Health Nursing were present on the occasion. The department of mental health nursing aims to prepare nurses to assume responsibilities as professional, competent nurses in providing promotive, preventive, curative and rehabilitative services to the mentally ill patients. Mental health nursing is a profession, possessing its unique history, ideology, knowledge and skills. It provides services to individuals whose primary health needs are related to mental, emotional and developmental problems, especially serious disorders and persistent disabilities. Psychiatric nursing is a specialized area of nursing practice, employing the wide range of explanatory theories of human behavior as its science and purposeful use of self as its art. It is committed to the maintenance, promotion and restoration of optimal mental health for individuals, families, community groups and society through the use of therapeutic relationships and interventions. The department of Mental health nursing is enthusiastic to provide quality education to students in graduation and post graduation level, under the supervision of excellent faculty. The department has promised to facilitate both professional and personal growth in the students and the faculty by encouraging and supporting their participation in continuing educational activities. 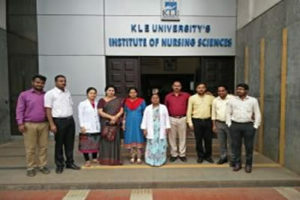 Aim: To create a center of excellence in Mental health nursing. To inculcate thirst for learning so that students develop in-depth knowledge. To describe the concept of normal and abnormal behavior. To inculcate sense of responsibility and accountability and put in hard and sincere work to excel. To describe the management of various mental disorders. Guide a postgraduate to develop capabilities to learn, diagnose and take up research work. To explain the dynamics of personality development and human behavior. To apply the nursing process approach in caring for the patients with mental disorder. To incorporate evidence based nursing practice and identify the areas of research in the field of psychiatric nursing. 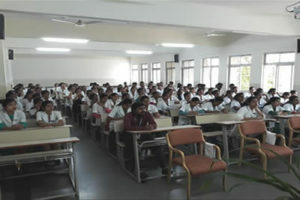 Students are posted to Dharwad Institute of Mental Health and Neurosciences (DIMHANS) and National Institute of Mental Health and Neurosciences (NIMHANS) Bangalore.